The Google Nexus One smartphone is finally here and you can buy it immediately. The buzz building up to it has been phenomenal to say the least. The question everyone is asking is: is this the iPhone killer? Not really. At least not in the way we have been thinking about the Google phone -- a much better iPhone. On the other hand, Google lays the groundwork for a radically different vision of how it would like people to use phones and services. The giveaway is the slogan Google has put out: Web meets phone. What does it mean for consumers? It would mean lower costs and more services. And it will come in small doses, which Google calls "iterations." 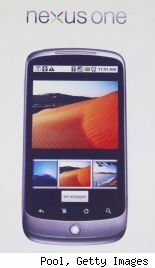 With the Nexus One, Google is trying to break away from the stranglehold the network companies have on equipment and services. If this succeeds, it will tie the phone further with the Internet. Google has already created a service called Google Voice that gives you a number and lets you tie your different phone numbers and voice mailboxes together. Even though the service sounds unremarkable, it becomes a different beast if it is coupled with the VoIP services of another application called Gizmo5 which was significantly acquired by Goggle in November 2009. Together with Gizmo5, Google Voice gives one the ability to make long distance calls from your computer to phones. Is Google moving toward coupling the Nexus One with the Google Voice plus Gizmo beast that might emerge in the near future? Nexus One significantly runs on a much faster 1GHz chip, compared to the 600MHz iPhone, and it allows one to run more than one application at the same time. This will allow Nexus One to be used as just such a phone. If Google does succeed in taking this path, it would mean that a mobile phone network becomes redundant, and all one needs is a data plan. All your calls will begin and end within the Internet. With the Internet becoming a giant phone system, all you would have to pay for is a wireless data plan. That kind of has a sweet ring, doesn't it?